In this entry I have a few things to update. 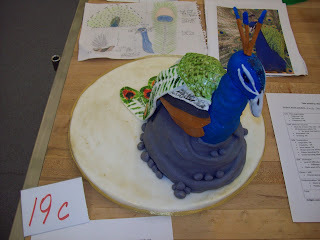 I placed in the top ten for a cake sculpting competition at school! 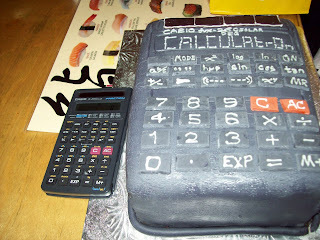 Also I'm going to post some pictures of a cake I made for my grandma for her birthday, as well as a calculator cake that I made for my boyfriend for his graduation. 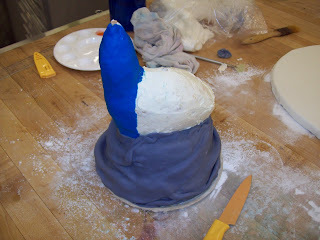 The competition consisted of two days of sculpting madness and it nearly drove us all insane! While I was satisfied with my final product I know that my fondant could have been a lot cleaner, and I could have put more thought into how i sculpted the head. Having said that, it should be noted that my cake went missing on the morning of the second day of the competition, and I had to start over! SO for a cake made in about 6 hours, I'm pretty pleased with the results! 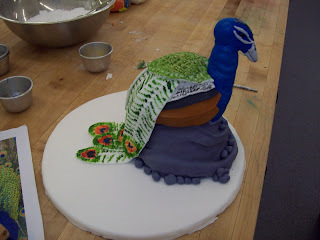 The competition cake is a peacock. 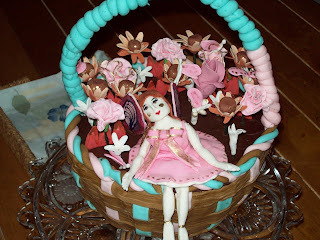 The cake that I made for my grandma is a flower basket with a fairy sitting in it. She loves fairies and flowers, so I thought I'd try my hand at some gumpaste flowers for the ocassion. I had never made them before, and they were pretty difficult, but with some practice I'm sure i'll get the hang of it! 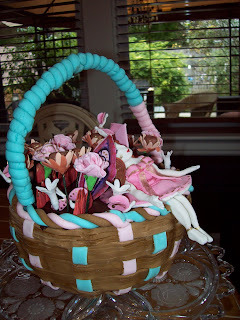 I really enjoyed making the carnations, the ruffles on the petals were difficult at first, but became easier as I went along. The calculator was just a simple little congratulations to my boyfriend Henry, who has been slaving away at school and just graduated last week! Hooray for Henry! It was modeled after the calculator he used all through university. Now on to bigger and better things, congratulations honey! Hope you all enjoy the pictures, and I promise to make bigger and better cakes for next time!